In the last lesson, Lesson 45, we continued looking at Vedic accents in various situations. We looked at the accent in declinable stems, the accent in compounds and verbal accents. Let us take our investigation of accents further and see how the accents behave in other situations. We will look at how the accent behaves in nominal verb forms and with verbal prepositions. We will also analyse a verse from the Rig Veda. We saw how tense participles (present, perfect etc) are accented along with the verbal accent. Now, if these tense participles are compounded with one or more prepositions, they retain their accents while the prepositions lose their’s. [Note that in Vedic Sanskrit, the verbal prepositions are are normally separated, like the verb, from the participle also, by the transposition of one or more words or being placed after the participle. The preposition then, of course, keeps its accent. The past passive participles are always accented on the final tá त or ná न. But when compounded with a preposition, it loses its accent, and the preposition retains its accent. If there are two prepositions, the first one also loses its accent. We will look at infinitives in a later lesson. Continuatives formed with “tvā”, “tvī” and “tvāya” accent the suffix, while those formed with “ya” and “tya” accent the root. In principal sentences, the preposition is normally detached and precedes the verb (sometimes follows the verb). The detached preposition is accented. And when there are two prepositions, both are independent and accented. Let us take an example verse from the Rig Veda. This verse is RV 1.1.2 with Griffith’s translation. ईड्यो॒ नूत॑नैर् उ॒त । Worthy is Agni to be praised by living as by ancient seers. sá devā́m̐ éhá vakṣati ॥ स दे॒वाँ एह व॑क्षति ॥ He shall bring hitherward the Gods. 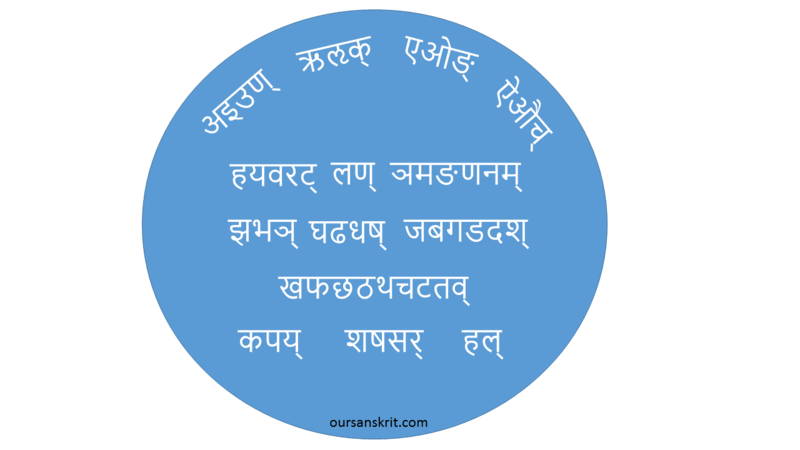 The metre of the hymn is Gāyatrī. This consists of three octosyllabic verses identical in construction. When normal, each of these verses ends (the last four syllables) in ~ – ~ ~/-. [The first line in this verse is of irregular metre]. The first two verses are treated together as a hemistich. Note that the visarga in agníḥ, since it is before a “p”, is to be pronounced as an upadhmānīya spirant. That is an “f” sound. So agníf pū́rvebhir etc. pū́rvebhiḥ पूर्वे॑भिः Instrumental plural of masculine adjective “pū́rva” “by ancient”. In Vedic Sanskrit, the ending “ebhis” is also used commonly as “ais” for “a” ending stems. In Classical Sanskrit only “ais” is used. nū́tanaiḥ नूत॑नैः Instrumental plural of masculine adjective “nū́tana” “of now, young”. Here the “ais” ending is used. This combining of the “ais” ending and “ebhis” ending in the same stanza is common. ā́ आ Note how the the preposition is separated from the verb. [In classical Sanskrit it would have been āvakṣati.] Note also that this preposition is accented as we mentioned before in this lesson. This is the end of lesson 46. This concludes the discussion on accents.